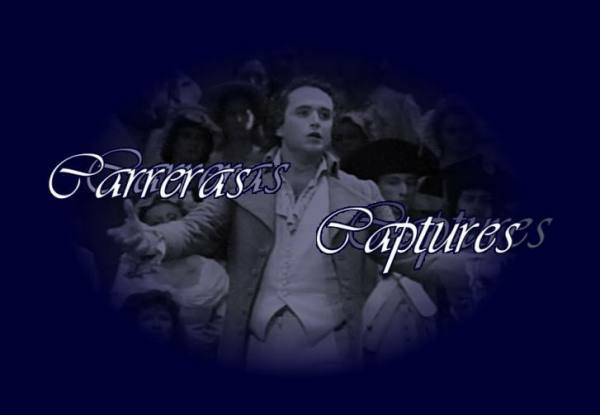 presents more than 30 hours live recordings from operas and concerts with José Carreras in Real Audio, Albums with screen captures, Real Slide Shows, Real Videos, librettos, texts, links and more. Baltsa, Battle, Bruson, Caballé, Cappuccilli, Cotrubas, Deutekom, Ewing, Freni, Ghiaurov, Gruberova, Masurok, Plowright, Pons, Ramey, Ricciarelli, Sills, Stratas, Toczyska, Tokody, Van Dam, Weikl, Wise and a lot more. Like some of the albums already do, the captures of the future albums will tell you more of the story of the opera or film. I combined German and English text on pages whenever it seemed to be necessary. Please be indulgent with my uncomplete English. Carreras Captures is a non-profit site and is not connected in any way with Mr. Carreras or his management. This site is best viewed with a resolution of 1024 x 768, but should not make problems with 800 x 600.